This article should be considered as supplemental to Dr Keller’s in this issue of IF!. In just a moment I will act on his suggestion to outline what later befell the collaborators on COSMOS, but first I must correct a mistake. I have been given egoboo where credit is not due. 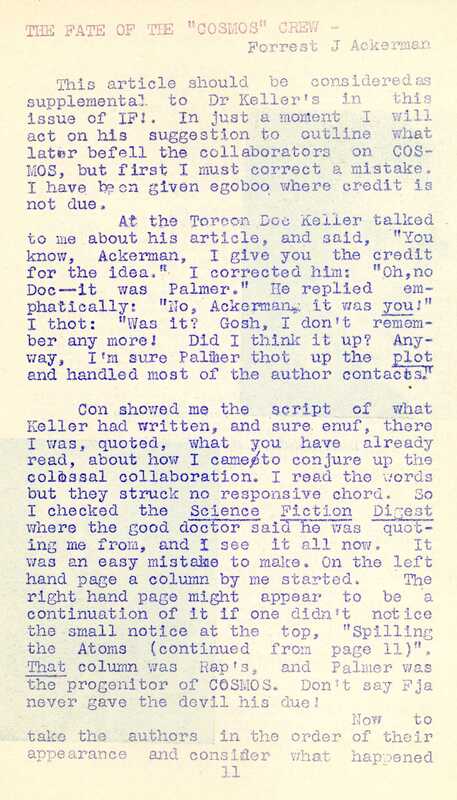 Con showed me the script of what Keller had written, and sure enuf, there I was, quoted, what you have already read, about how I came to conjure up the colossal collaboration. I read the words but they struck no responsive chord. So I checked the Science Fiction Digest where the good doctor said he was quoting me from, and I see it all now. It was an easy mistake to make. On the left hand page a column by me started. The right hand page might appear to be a continuation of it if one didn’t notice the small notice at the top, “Spilling the Atoms (continued from page 11)”. That column was Rap’s and Palmer was the progenitor of COSMOS. Don’t say Fja never gave the devil his due! Now to take the authors in the order of their appearance and consider what happened to the afterwards. RALPH MILNE FARLEY: Went on as a “poor man’s Burroughs” with his series of Argoyarns about Miles Cabot, the Radio Man. Wrote an unusual story for Weird Tales in the second person – where everything happened to you – which noveltyarn (“The House of Ecstasy”) was picked by Alfred Hitchcock for inclusion in his pocketbook, Suspense. Farley was to collaborate with Weinbaum, and complete Stanley’s “Revolution of 1950” (nee “The Dictator’s Sister”) for posthumous publication. It was Farley who got Palmer his job as editor of Amazing. Farley is about to enjoy a renaissance between hard covers under the aegis of the Fantasy Publishing Co, which will offer his Omnibus of Time and others. DR KELLER: Was yet to see printed “The Dead Woman”, “The Devil and the Doctor”, “The Lost Language”, “The Solitary Hunters”, “The Sign of the Burning Heart” and other memorable stories. Was, beginning in ’47, to reverse all polls voting for “best ex-fan who became a pro” and be considered the best actifan ever formerly a pro! The Keller Story is a phenomenon paralleling The Jolson Story, of the amazingly revived popularity of a personality once considered passe. I am checking a rumor that Avalon will become one-shot filmakers for the purpose of producing “The Ego and I”, the autobiography of Dr Keller, starring Sam Moskowitz. ARTHUR J. BURKS: Was to continue hacking ’em out til 1939 when he was to produce his masterpiece, “Survival”, based on a plot by L. Ron Hubbard, featured in the first issue of Marvel Science Stories and voted the best story of the year. He more or less lapsed into obscurity in later years, but just lately has been seen again on a couple of occasions. Burks took fifth place in popularity on his chapter of COSMOS. Since Keller didn’t, I might continue the practice of naming popularity place of the contributors. Farley tied with Burks in 4th place, and Keller was in 3d. BOB OLSEN: Good old Bob! His best years were behind him, with his fine 4th dimensional series, his termite tales, his farcical classic, “The Educated Pill”. Possibly some of his insect stories were published after his chapter of COSMOS, which shared 8th place with 2 other installments, but his star had begun to wane, then, I believe. Oddly enuf, he just phoned me the other day, and will attempt a come-back in the stfield via a local Author’s Agency which modesty forbids my mentioning. CAMPBELL: Can you imagine our beloved John W. Campbell rating only an 8th place? I would be insulting the intelligence of IF!’ intelligentsia to “reveal” the destiny that was to be Campbell’s, for if they don’t know that they better go back to kindergarten. RAE WINTERS: Pseudonym of Ray Palmer. Copped sixth place over contribution in his own name which only rated 10th. Climbed on a ladder of modesty and integrity to the pinnacle of success: Editor of the #1 science fiction magazine of all time; loved, honored, admired and respected; the envy of every true fan and my personal idol. OTIS ADELBERT KLINE & E. HOFFMAN PRICE: Kline is dead, Price has declined. Kline achieved a world-wide fame as an agent, had one of his Argosy serials, “Jan of the Jungle”, filmed as a movie serial, “Call of the Savage”, and lived to see 3 of his books – “The Planet of Peril”, “The Prince of Peril” and “Maza of the Moon” become hard cover collectors’ items. Price continued for some time as one of the better-liked contributors in the weird field. Their collaboration tied for 5th place. ABNER J. GELULA: Faded into oblivion. Never a noted writer, remembered today only by old-timers. Took next to last place in the COSMOS popularity poll. It was reported (probably by myself) that Universal had purchased a story of his from the pages of Amazing Stories, “Automaton”, and for a time early fandom was all excited, waiting for the appearance of the picture, but it never materialized. A. MERRITT: Requiscat in Pace. No Latin student, I readily admit that I may have butched the spelling of that. At any rate, tho one might with the best of intentions wish for the Lord of Fantasy to Rest in Peace, his is regularly revived, and his installment of COSMOS, which took First Place, has been reprinted 3 times if I recall correctly. (Quick, Henry, my Merritt Biblion – why hasn’t it been published yet?) Titled “The Last Poet and the Robots” as a part of COSMOS, it was slightly revised so as to stand as an independent story, and published in the October, 1936 issue of Thrilling Wonder Stories as “Rhythm of the Spheres”, reprinted in Avon Fantasy Reader, and in a little known limited pamphlet edition (mimeod) out of Denver. By golly, come to think of it, it was also reprinted in 2 parts in fanmag Alchemist. We have lived to see practically every scrap Merritt made widely available to the public in pocket book form, with no end to his popularity in sight. J. HARVEY HAGGARD: Took 9th place. Never became a distinguished stf writer, but was usually a dependable one. His name faded and he is seldom seen any more, unless in Planet, whose contributors I frankly don’t follow any too closely. EDW. E. SMITH, PhD: His chapter took second place, was later featured in somewhat revised form in 10th Annish of TWS. At that time the First Lensman was only a gleam in his eye and the Convention at which he was to be Guest of Honor (the Chicon) was a lustrum in the future. As every neophyte must know, he has become one of the most popular of the book authors, with 2 of his titles out of print. P. SCHUYLER MILLER: Tied for 6th place. Has maintained a slow, steady pace thru the years. Was yet to write “As Never Was” and “Sands of Time”, both included in Adventures in Time & Space. If fans have any complaint against him, it must be that he does not produce often enuf to satisfy them. LLOYD ARTHUR ESHBACH: 11th place. Graduated from a medium class author to a first class publisher. Suggestion: Why not a Fantasy Press edition of COSMOS??? EANDO BINDER: Poor Earl & Otto – they took last place! Still, on an absolute scale, their chapter rated a little better than average. This writing team, once so popular, split up, Otto to go into comic book scripting, at which he reportedly has lived wealthily ever after. EDMOND HAMILTON: His installment stood right in the middle on the popularity poll. The halcyon days (some spelled it halitosis) of single-handedly writing Captain Future magazine were still ahead of him. Like Old Man River, Ed Hamilton has just gone rolling along, entertaining stf & fsy readers for a generation. At the time he contributed his chapter to COSMOS he’s never heard of Leigh Brackett, who is now Mrs Hamilton, the center of his Cosmos. One final mention must be made of HANNES BOK: Doc Keller didn’t record it, but young Hannes, then utterly unknown, did the woodcut or linoleum block to serve as a frontispiece for the serial. This was 4 years before a young fan named Ray Bradbury was to go to the First World Science Fiction Convention with a portfolio of Bok samples which he took to the offices of Weird Tales to enthuse the then-living Farnsworth Wright to use. Bok, as we all know, went on to become one of our favorite fantasy illustrators of all time, with a first Artfolio now honoring him, and two books exhibiting his artistry in mimicking Merritt. It is now understood that negotiations are afoot for the greatest illustrating coup to date, the designing of the interior illustrations for the deluxe hardcover edition of Austin Hall & Homer Eon Flint’s THE BLIND SPOT with THE SPOT OF FIRE.